A couple of days ago, a friend and I had been discussing what else hyper/local play could do to expand business and create differentiators, and I’d mentioned to him that from empirical evidence of comments from people and on our apartment mailing list, ironing services inside apartment complexes were a major point. The next morning, went downstairs to drop the kids to the school bus, and what do I see ? 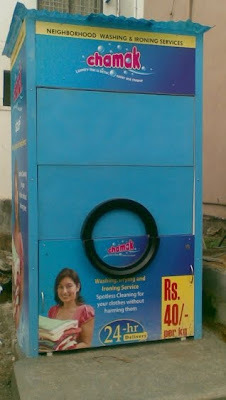 Each kg of clothes is 40/- and they even SMS you once its done! This was a nice find. And the timing – coming the morning after the discussion about it – was sweet indeed.Quite obviously, its intended to be a big chain over time – a la Ferns And Petals for flowers. They seem to have about 10 locations in Bangalore itself. Someone obviously heard the chatter about the pain points with the existing vendors etc and decided to give this a shot. I’m not yet debating about it being a great idea etc, but its an opportunity, and its heartening to see someone take a crack at it. On digging just a little, here’s what I found – introducing the Village Laundry Service funded by Innosight Ventures, and promotes individual entrepreneurs to run their rigs. Lesson for the day: Its not just the idea! One’s heard often that 10 other people have exactly the same idea at the same time as you have it (or even earlier), and it boils down to execution, but it was still a very wow moment to come across a real world example of one such.There are opportunities galore. We often do not explore enough, or fail to understand the real pain points of the consumers we’re trying to address. It takes ears on the ground, and a continuous interpretation of what it all means, to identify what might serve, delight the consumer and differentiate the service. Even in the above context, perhaps there’s a potential for someone to provide infrastructure with multiple interfaces, basic CRM handling, billing solutions, etc, that could lend a professional edge to such services ? Of course, the work just starts here. The opportunity needs to be evaluated, the roadmap for serving the market needs to be readied, and most importantly, the idea needs to get out of the door a.s.a.p! Borrowing from a cliched quote, execution is not the most important thing, its (almost) everything!